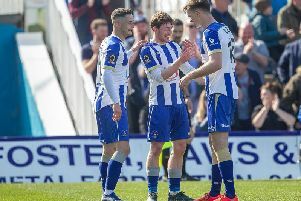 PAUL Murray slammed Hartlepool United’s lack of “passion, desire and commitment” after Blyth humbled his side in the FA Cup. Pools took the lead last night at Victoria Park and looked in command in the second round tie screened live on television before an all too familiar – and dramatic – collapse. Jonathan Franks’ opener in the 31st minute was cancelled out after the break by former Pools midfielder Stephen Turnbull’s sublime free-kick before Jarrett Rivers’ strike sealed the win in the 90th minute. The second-half collapse left Murray bouncing as he described his side’s performance against the Evo-Stik Northern Premier League side as “diabolical”. “There was some angry words exchanged at the final whistle,” said the Pools boss. “We did well first-half and created some opportunities and should have scored another couple of goals. “We had a league game a few weeks back which was the same, we went in front and then gave it away second half. “Last night’s performance was even worse. “There was no passion, desire, commitment in the second half – it was total chalk and cheese. The 38-year-old has only been in the job six weeks, his first in management at the club he played more than 100 games for. The former midfielder, who relished a battle as a player, admitted the defeat hurt. Murray added: “Personally, it really hurts because the character and the way I played the game was full of passion and desire and making tackles and relishing the challenge. “We didn’t have too many, if any, of those in the second-half. “I have said to the players, I can’t cross the line for them, they are the ones doing it and have to take responsibility for their performances. “They are in a good profession at a good club and they get looked after. Pools need to quickly find a way of grinding out results once they take the lead in matches but Murray says that will only come with hard work. He admitted confidence is rock-bottom at the club and has called for the under-pressure players in his squad to stand-up. Murray added: “We just saw the confidence drain in the second-half. “We played some good stuff first half and should have gone in two or three nil up. “But second-half we just wilted and it drained from them. “You need men and proper characters to get through these spells and the only way to do that is through hard work.